1. 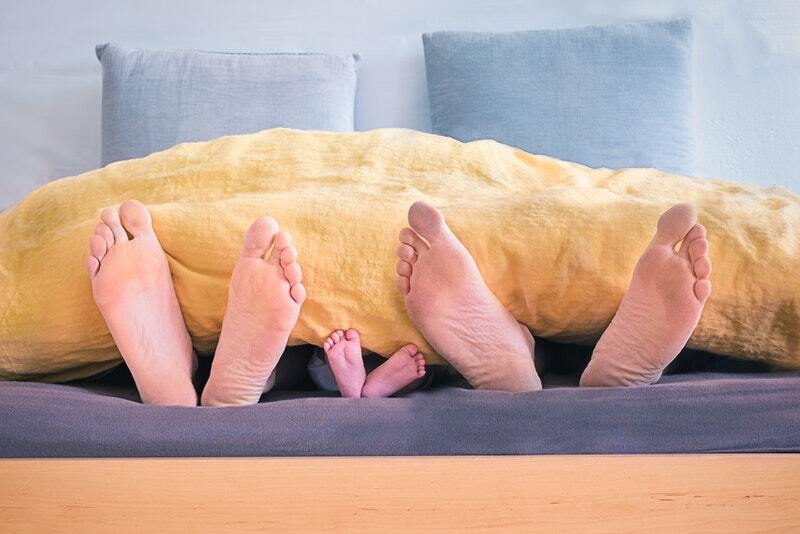 You start co-sleeping so you can get more sleep, but eventually end up getting less. There’s a terrible irony in that the beginning of co-sleeping for many of us, is the sheer desperation to get more sleep. And by more, I mean more than three hours of broken sleep. So when starting from that horribly low baseline, five hours punctuated with the odd kick, and a few groggy breastfeeds begin to look VERY attractive indeed. Fast forward three years and there’s a significantly larger person sharing your bed, rather than appended to the side of it in their little cot. This person may come into your bed before even you want to go in your bed, say, at 10pm. And so begins your 1100th broken night. It is pretty cute though. In the early days, having your little baby laid right beside you in their cot, pulling them towards you for a feed and pushing them back when they’re done. And once they’re toddlers it’s like having a live, warm teddy bear snuggled in your arms close to your chest. Until they kick you in the fanny and throw the duvet off, leaving you shivering, and gripping to the side of the double bed so you don’t roll off your perilously thin portion of mattress onto the floor. 3. People will think you are weird. In my case, that’s not a problem because I am a little bit weird. But most people put co-sleeping in the same ‘weirdo’ category as breastfeeding a toddler (yeah, I did that too. Soz) because we all know babies are basically little robots that you put in a cot whilst in the strange hinterland of being drowsy, but awake and then they know how to get themselves to sleep forever and ever and ever! Hurrah! Except they don’t. They like a hug, they like your smell, they like your sound and even when they do go to bed in their own space, sometimes, they get back out of it. Or in my youngest’s case, they get back out of their bed all the time. Like, every single night. 4. You may wonder whether you will ever get to cuddle your partner in bed again. So intimacy is what got you into this mess in the first place and you might wonder if you will ever experience it again. We attempted a cuddle *this is not a euphemism* the other morning but were forced asunder by an outraged three year old who shouted “MY MUMMY” at us as she prised us apart and reclaimed her ownership of the middle 50% of the bed. 5. It doesn’t last forever. This article isn’t intended as any kind of guide or advice on co-sleeping. If you’re considering co-sleeping with your baby, please take time to research the safest methods – The Lullaby Trust is a great place to start.